HI!! I’m so excited to meet you!! 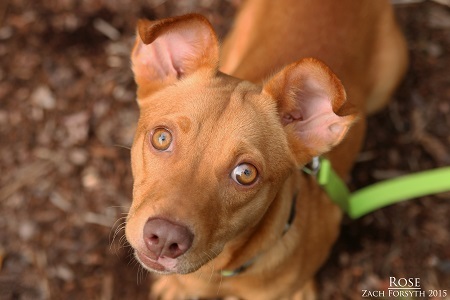 My name is Rose and I am a very spunky 1 year old terrier mix. Hey? Guess what? Want to know my favorite thing about fall? We get to play in the leaves! Want to know my favorite thing about winter? We get to play in the snow! Want to know my favorite thing about spring? We get to play in the flowers! Want to know my favorite thing about summer? We get to play in the sand! Want to know my favorite thing about you? You play with me!! Hooray! I love to play. Some say this energy can be focused into other things like puppy classes! I think that sounds like a fun idea! My ideal home would be a place maybe in the ‘burbs with the backyard and a little less traffic than there is in this big city. I do great with dogs, cats, and older kids. At the end of the day, after we are all done playing, I can’t wait to curl up with you and snuggle the night away. I am a sweetheart and will make a loving companion. Do I sound like the friend you have been looking for? Fill out the adoption application so we can schedule a meet and greet! I am fixed, vaccinated, and microchipped. My adoption fee is $250.